We believe that God is love and God is good. All Christians affirm these simple truths. But for a God whose defining attribute is love, his actions don’t always appear to be very loving. And for a God who is perfectly good, he seems to have done some things that aren’t very good at all. Does our beautifully good God have an ugly side? Does God have something to hide? 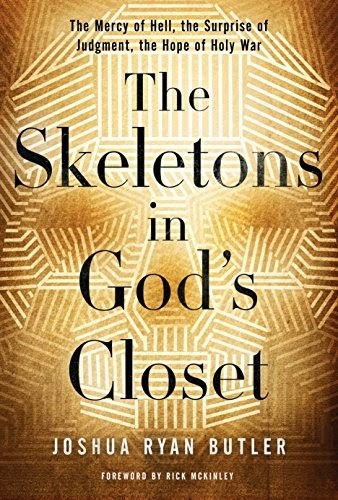 In The Skeletons in God’s Closet, Joshua Ryan Butler sets out two answer three questions: Would a merciful God send people to hell? Would a loving God condemn people at the judgment? And would a good God wage holy war? Butler contends that we have set up caricatures of God—pictures that contain a semblance of the truth without the substance of reality. Throughout the book, he dismantles these caricatures, replacing them with pictures of God that are much more accurate, much more biblical, and much more beautiful. If you enjoy the writings of C.S. Lewis, you’ll likely enjoy this book as well. Lewis’ influence is evident throughout, especially in the first two parts of the book. And much like Lewis’ work, Butler’s thoughts proved to be enjoyable, even when I disagreed with his conclusions. Speaking of C.S. Lewis, I was actually partway through his Pilgrim’s Regress when I started reading The Skeletons in God’s Closet. That was fine at first, but when I reached chapter four of Butler’s book, I quickly realized just how extensively he was going to rely on The Pilgrim’s Regress. How’s that for my timing? Fearing spoilers, I had to grudgingly put down Butler’s book and finish Lewis’ book before continuing. But it was worth it. Both books are excellent. On the subject of hell, the thing I appreciate most about Skeletons is the terrestrial nature of Butler’s eschatology. In other words, it all takes place here on earth. We don’t go away from earth and up to heaven; Jesus brings heaven down to earth. Likewise, hell is not some other dimension out there in the aether; it’s a real physical place on earth—outside the city, as Butler so carefully reminds us. I’m really intrigued by the model of hell Butler proposes. It is very similar to the view of C.S. Lewis, but Butler has fleshed it out in greater detail. Still, while I agree with the majority of details leading up to his conclusion, I disagree with the conclusion itself. But that’s all I’m going to say about that for now. I plan to do another post soon in which I’ll explain my own view and respond more fully to his. Butler’s view of judgment is also very similar to that of Lewis. It borders on inclusivism without quite spelling it out. I found myself mostly in agreement with Butler in this section—more so than in the others. While I’m not ready to affirm inclusivism (and I’m not sure if he is either), I remain hopeful. But one burning question was never explicitly addressed: Must we affirm belief in Jesus during this life in order to receive eternal life after the resurrection? The section on holy war was, in my opinion, the most disappointing—but that’s not to say that I didn’t thoroughly enjoy it. It was well thought out, and Butler successfully displaced many of the caricatures that surround the subject. But it was disappointing for me because Butler accepts the notion of a “just war.” Furthermore, while he critiques “the myth of redemptive violence,” he still believes that violence can serve in a positive “preservative” function. All in all, I really appreciated The Skeletons in God’s Closet. While Butler and I differ a bit on some of our ultimate conclusions, we’re obviously both looking at the same beautiful picture of God revealed in Jesus Christ. I’m glad that I read his book, and I would without hesitation recommend that you do the same. Pick up your copy of The Skeletons in God’s Closet for Kindle, for Vyrso, or as a paperback. Disclosure: I received a free copy of the book in exchange for an honest review.